If you have been doing CrossFit for any amount of time, you have probably done some mobility work. Among other issues, a good mobility program addresses soft tissue restriction, short and tight muscles, and joint range of motion issues. Some of the more common tools used for mobility work include foam rollers, lacrosse balls, jump stretch bands, and Voodoo bands. However, we are certainly not restricted to conventional tools. You have probably heard of barbell smashing, but here is a creative way to use the barbell to mobilize the bottom of the squat. Place the barbell in the hip crease and sit in the bottom of your squat. The barbell will help you hold the position. If you need some support, simply hold on to the rig. Make sure to keep an upright torso and move some side to side to hit all the corners. Try to hold that position for at least 2 minutes. While Voodoo bands are probably the best tool for flossing, they are a bit pricey. Old bicycle tire inner-tubes work in a similar fashion and are great for flossing. There are simple DIY instructions here for making the bands. Simply wrap it tight around the area you want to mobilize and floss as you normally would. For instructions on how to use “voodoo” floss, Invictus has a great overview here. The best part about using a bicycle tire is that you can go into your local bike shop and usually get it for free! You read that right! Car Buffer (think Black & Decker)… This one I learned from a friend who was a strength and conditioning coach at Clemson University. Start with the flat part of the buffer to warm the muscles then simply turn the car buffer on its side and run it over areas you want to work. It works very well on large muscle groups such as quads, hamstrings, and traps. Although you won’t be able to reach some muscles that are deeper, a car buffer will be the best “foam rolling” session you’ve ever done. They sell for $20-$25 at Walmart. A tennis ball can actually be a cure for flat footedness. If your job (or your sense of fashion) requires you to wear boots, high heels, or any shoe with a raised heel, a tennis ball should be a regular tool in your mobility arsenal. Press into the tennis ball with the sole of your foot and grind by half circles back and forth. Do not try to roll out. You can also use the tennis ball for shearing. Simply let the ball hold your foot at an angle and press down. You will begin to feel the fascia in the bottom of your foot release. One of the great things about mobility work is that we are not limited to regimented drills, programs, or even tools. We all have to find the best ways that work for us and our own individual needs. What are some of your favorite tools that I didn’t mention here? Head over to the community section and share some ideas with everybody. 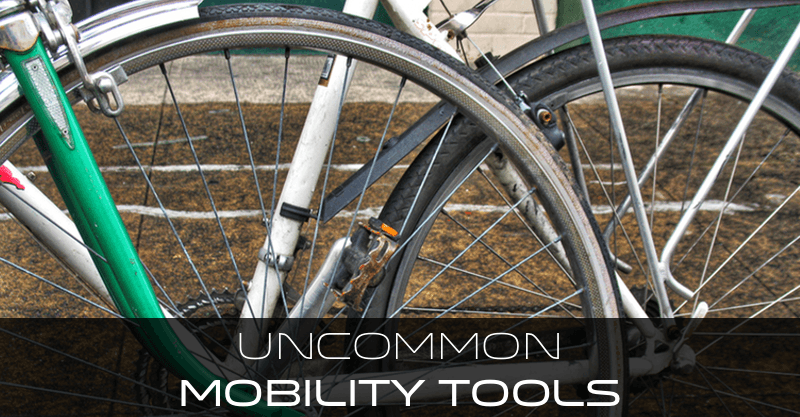 We all have our own mobility issues and you might be able to help somebody cure theirs.